Croton seed (Badou)-Croton tiglium L.
Botanical Name: Croton tiglium L.
Part Used & Method for Pharmaceutical Preparations: The ripe seeds are gathered in autumn, dried in the sun and ground into powder. 1. Abdominal pain and constipation due to cold or retention of food in the intestines. Croton seed (Badou) is used with Rhubarb (Dahuang) and Dried ginger (Ganjiang) in the formula Sanwu Beiji Wan. 2. Retention of milk in babies, profuse sputum and infantile convulsions. Croton seed (Badou) is used with Medicated leaven (Shenqu), Arisaema tuber with bile (Dannanxing) and Cinnabar (Zhusha) in the formula Baochi San. 3. Ascites. 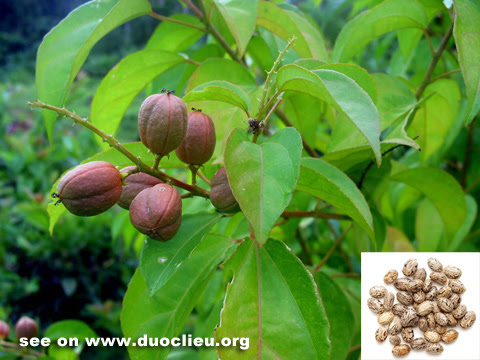 Croton seed (Badou) is used with Apricot seed (Xingren). 4. Pharyngitis, excessive sputum blocking the windpipe, rapid breathing and even suffocation. The powder of Croton seed (Badou) is blown into the throat to cause vomiting. 5. Boils and carbuncles. Croton seed (Badou) is used externally. Cautions & Contraindications: This herb is contraindicated during pregnancy. It must not be mixed with the herb Pharbitis flower (Qianniuhua). No hot food or drinks should be consumed while administering the herb.